Many inbound marketers and business bloggers get so caught up in (or weighed down by?) the idea of creating blog content, that after hours or days of looking at a blinking cursor, there's nothing but an outline or a few introductory sentences to show for their work. Well, I guess that's one way to approach business blogging. But another way is the agile way -- the way that lets bloggers go with the flow, respond to new opportunities, and generally get over the fear of the blinking cursor and, as Nike said, Just Do It. Being agile in any area of your marketing has a ton of benefits -- we've covered those in this blog post if you'd like to learn more about them -- but nowhere, in my opinion, are the benefits so strong as they are in business blogging. This post is going to show you exactly how you can be an agile business blogger, and why it is so beneficial for your marketing. Editorial calendars help marketers set and maintain their content strategy. Often organized on a monthly basis, they'll include things like topics to be written, keywords targeted within that copy, and publish dates and times. Even though this kind of advance content preparation sounds like the opposite of agility, it actually helps enable you to be an agile business blogger. Create blog content that brings in more unicorns at the top of the funnel. Create blog content that speaks to horses, the new persona you're looking to target. Create thought leadership blog content that increases your overall credibility in the unicorn -- and soon horse (fingers crossed!) -- grooming industries. Now, knowing that, you don't have to stick to the exact topics on the exact days you've slotted them on your editorial calendar. Instead, feel free to move things around, and write about new topics that come into your head as the month progresses that still achieve these goals. Take advantage of guest content that unexpectedly comes your way; newsjack if the opportunity arises (more on that in a moment); heck, take a sick day if you have to! If you outline how you'll execute your editorial strategy at the beginning of the month, you have the structure to still meet your goals, but you'll also maintain flexibility to move content around as needed and write content that, in the moment, might actually be better than what you anticipated at the beginning of the month. So if you don't already have an blog editorial calendar, download our free template -- and check out our blog post about how to use it right. 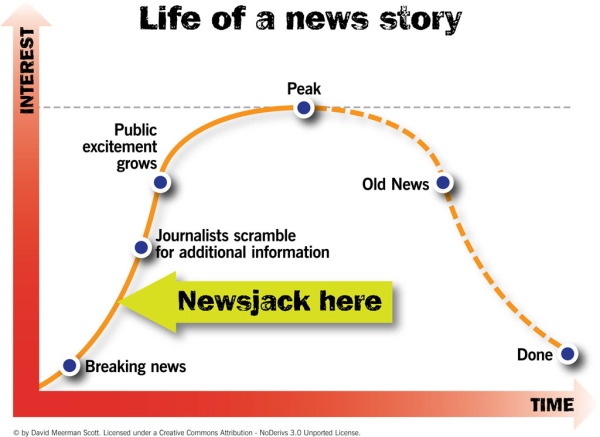 If you wait too long to jump on the popularity bandwagon, your efforts are largely for naught, and the content landscape is oversaturated with stories around that topic -- and interest is diminished. When you see trends emerging, hop on 'em like a hotcake (Is that a real saying, or did I make that up?) so you can see your blog reap the benefits. Things change fast; agile business bloggers are totally cool with this. When new ideas, products, or technologies emerge, get excited about it -- don't fear it! The bloggers that are the first to embrace new trends by testing them out, and writing about them, are the ones who see the most success. Those are the folks who are true thought leaders -- they're telling the rest of their community when they should (or shouldn't) care about something, and how it fits into their daily lives. For instance, when Pinterest started gaining massive popularity, we dug in to see if there were any B2B applications of the social platform -- and wrote this blog post about it for our B2B brethren. Now, it's totally possible there were no B2B marketing applications for Pinterest ... and sometimes, our little experiments with new technologies that emerge do end up being total busts. But for every three investigations we start, one of them ends up being a pretty big deal. The initial time wasted trying to see if the latest and greatest idea or product is a big deal or not is pretty miniscule, when you compare it to the results you see when the latest and greatest actually is a big deal, and you get to be the one that tells everyone all about it. Experiment With Length: Maybe your audience is looking for more in-depth content, or something shorter-form that is less time consuming. Turn Written Content Into Visual Content: Turn an old post -- or one you were planning on writing -- into a piece of visual content if the story is better told through visuals than words. We've done this with great success, first publishing a written post about shameless marketing tactics here, and then creating a visual for it here. Try Multimedia Content: Content can get even more interactive if it's a video, a slideshow, or even a new tool you've built. See if you can use your blog real estate to get readers interacting with your content more. The great thing about doing this with your blog is ... it's just one blog post! If it doesn't work, hey, next time you don't have to do it. That's what agile marketing is all about; failing fast, and making iterative improvements. In other words (and far less ridiculous words, at that), write what inspires you. It's critical that a business blogger is able to write toward a specific goal. 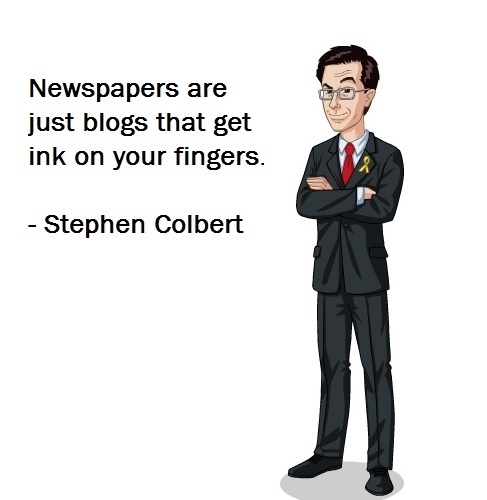 That means if you need to generate net new leads via your blog, you can write blog posts that will do that. If you need to get product awareness out there, you can write blog posts that will do that. If you need to gain credibility as a thought leader, you can write blog posts that will do that. But there's also something to be said about writing because you're inspired to do so. Let me tell you what I mean by this through a little story. Whenever someone new joins our team here, they come over to talk about blogging. "What should I write?" is always the first question. My response is always, "What do you want to write?" That's not my response because they can just write whatever they want to, and have it published on the blog; we have topic guidelines and editorial standards to which we must adhere. But by knowing what they like to write about, we can get to a topic that's exciting for them. I go through this exercise with new bloggers because time and again, when I read blog submissions from people who wrote about a topic they don't really care about, it sounds forced, incomplete, and is generally pretty hard to get through. When they write about a topic they know a lot about, and really care about, it comes through 10,000% in the writing. So, read other stuff, let ideas percolate, keep a notepad by your bed so when you dream about blog posts you can write them down (other bloggers will know what I mean by that). This is why you have that agile editorial calendar of yours -- so you can bang out those exciting blog posts when they hit. I think you'll be surprised just how well content performs when you really believe in it, because that passion is usually reflected in the writing. Your grammar and spelling is accurate. Your content is factually correct -- nothing instills less confidence in your readers than spewing inaccurate information. Your content reads well -- the general tone and flow should be easy to get through for readers, and it should consistently align with a written style guide. You're not offending anyone (readers, investors, co-marketing partners) with the content. These are all things that can befall any blogger, but agile business bloggers are even more prone. If you have this trusted buddy by your side, you should feel confident about your agile mindset, and reap the benefits of it, too!